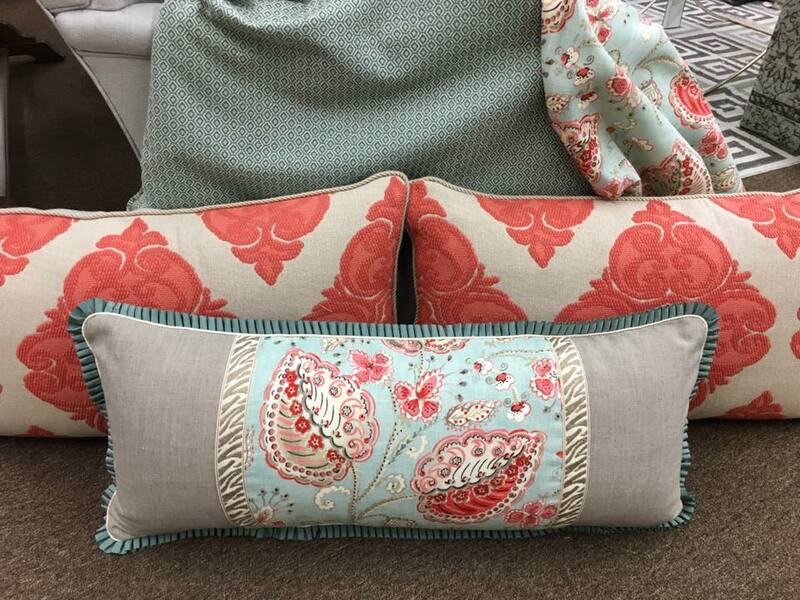 These beautiful custom pillows just came in from our talented workroom and are awaiting arrival to their new home- with all of that layered trim and pattern application we couldn’t help but share how lovely they turned out! This room is going to be absolutely stunning with coordinating aqua diamond patterned chairs and custom drapery out of the aqua/coral “floral” print. Designer throw pillows are truly the “frosting” on the cake and some of the “jewelry” that finishes off the entire aesthetic of a space and creating unique, one-of-a-kind pillows just so happens to be one of our specialties here at Front Door. Our talented interior designers love to get creative with fabric and trim applications taking into consideration all of the other various elements and textiles in the room so that they pop and showcase the room’s scheme in the best way possible. Stop by the store today and let us get creative with your space- pillows are one of the quickest and easiest ways to dress up and change up the look and feel of a room!